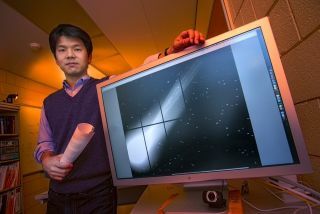 Stony Brook University professor Jin Koda (seen here) poses with a photo of Comet 2013 R1. Koda discovered that some particles in the comet's tail are accelerated to the speed of the solar wind. Plasma particles in a comet's tail can quickly whip up to the speed of the solar wind, according to observations of a comet made in 2013. Delicate filaments were observed coming off Comet 2013 R1 (also called Comet Lovejoy), a rarity so far in comet observations. The filaments were made up of water and carbon monoxide, indicating that they emanated from the comet itself. How they moved so fast afterward is still poorly understood. The filaments of gas erupt from the comet at low speeds due to heating from the sun, then are quickly accelerated — somehow — to the speed of the solar wind as the wind "blows" against them. "What's special is we captured the motion," Koda told Space.com. "We took a movie of the structure." This image shows the particles of the comet's tail hurtling through space at great speed. Scientists have found that particles in Comet 2013 R1's tail can accelerate up to the speed of the solar wind. Koda, who usually studies galaxies and cosmology, made the discovery by accident near the end of an observing run on Dec. 4, 2013. The comet was in the sky, and he thought he would take some exposures of it. Using the ground-based Subaru Telescope's 8.2-meter mirror, Koda captured three two-minute exposures of the comet in 20 minutes. After using a computer algorithm to "remove" the bright coma (cometary atmosphere) in the pictures, he was surprised to see filaments rapidly changing near the comet's surface. Subaru is uniquely positioned to capture comet structures such as this because it has a wide field of view, Koda added. This instrument is one of the largest optical telescopes in the world, but most similar observatories can only look at a narrow portion of the sky. As such, Koda is planning on putting in an observing request there the next time a bright comet appears. He said he expects all comets should have these filaments, but more observations are needed to confirm that hypothesis. "We want to repeat similar observations with a longer duration of time," he said. "If we can continue that for two or three hours, take [an exposure] every few minutes, we can see how things evolve for an even longer time period." Results of the study were published in the Astrophysical Journal.